The purpose of this lesson plan is to teach students the importance of planning and practicing a safe esccape plan in case of a fire at home. 1. 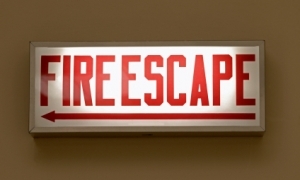 Identify the importance of a home escape plan. 2. 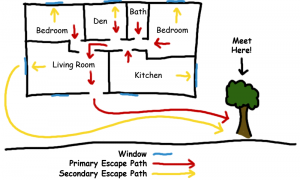 Plan and design a home escape plan. 3. Implement a planned home esccape plan. 1. Discuss with students what they should do if there is ever a fire in their home. a .The most important thing is to get out as quickly as possible. b. You should never waste time getting your favorite toys and other things. c. Fires can be dark and scary, but a plan and practice will help make your escape better. d. You should have a plan that you practice with your family. 2. Explain to students what a fire escape plan is. a. Each room should have 2 ways out. b. The plan should have a safe meeting place away from the home. c. Everyone in the house should know what the plan is. 3. Explain what a student should do if they are ever in a fire. a. Most fires start at night, when you are in bed. b. If you wake up to a fire, drop low and crawl to the door. i. If the door is warm, use the second escape plan. ii. If the second escape plan is blocked, crawl to the window. iii. Use a white cloth or flashlight to shine out the window so rescuers know where you are. Be sure to listen for the rescusers coming to help you. iv. If you can get out of the house, go straight to your meeting place. v. Never go back into a burning building. c. If you or your clothes catch on fire, Stop, Drop, and Roll. 4. Have students design an escape plan for their bedrooms. a. On a sheet of drawing paper, have students draw an outline on their room. i. Mark the door, windows and bed. ii. Be sure they include the closet. b. Using 2 different colors, students should draw paths to escape the room. c. If they are on the second story, they should wait at the window until a rescuer can help them. 5. Have students share their plans with the class. a. Discuss the good strategies, and adjust ones that are in need of help. b. Have students share their plans with their parents at home for practice. Information abbout the current Fire Prevention Week Theme, links to products, lesson plans, videos acnd activities for all ages. Information and activities for young kids and teens. 1. Students will be able to identify cooking areas of the home that should be “Kid-free” to avoid danger from fire or injuries. 2. Students will be able to implement a plan for their own homes that feature “Kid-Free Cooking Zones” for safety. 1. Ask students if they know what a fire hazard is and where some might be in their home. a. Students should identify the following: electrical appliances, electrical cords, matches & lighters, Fireplaces, materials on lamps, grills, kitchens, pot holders or paper towels left on stove, etc. 2. Explain to students that most fires start in the kitchen and it is because people don’t pay enough attention when they are cooking. 3. Ask students how they can help prevent fire and injuries while their parent or guardian is working in the kitchen. a. Responses will vary based on the age of students. b. Help watch younger children, stay out of the kitchen, only help if asked to, keep an eye on pots, don’t touch anything without permission, etc. c. The most important way to help is the focus of the lesson- Have a “Kid-Free” Cooking Zone in the kitchen and by the grill. 4. Distribute the Kitchen Activity sheet. Explain that there should be a 3 ft. “Kid-Free Cooking Zone” away from the stove. Have students trace the outlined zone on the sheet. 5. Have students identify other fire and injury hazards on the activity sheet. a. Younger Students: You may want to enlarge the activity sheet or project it on the screen and talk through the dangers as a whole class, while students circle/color their own sheets. b. Older Students: Have students work independently or in small groups to identify the hazards on the activity sheet. Discuss as a whole group the dangers in the picture. 6. Be sure students take home the completed Activity Sheet(s) so they can discuss what they learned with their families. Microwave ovens can be dangerous because certain things, like metal, should never be placed in them. Also, food from the microwave can cause scalding if you don’t let it cool. Always ask an adult to test your food for you. Pots should be on the back burners when possible. The pot shouldn’t be too big or too small for the burner. The handle should be turned to the back of the stove. Potholders should be used to touch hot items, but cloth and paper items should never hang over on lay on top of the stove. Never play with the stove knobs. Burners should only be on when a pot is on it. Appliances should be unplugged when they aren’t being used, but the cord should be safely wrapped up so someone doesn’t trip or pull the cord down. NEVER put an electric appliance near water. Ovens can be dangerous even when they are not turned on. Never play near a stove. Be careful of spills on the floors or counters. They can cause slips or electrocution. Hot water can scald your skin. Always let an adult test how hot the water is for you. Knives and other sharp objects should be stored in cabinets, drawers or locked knife blocks. It is very dangerous to have a sharp object hanging over the edge of a counter. Never use cabinets, drawers, or appliances to climb up to hard to reach areas. Ask an adult for help.